When you think of a European country and sausage, which country do you think of? For me it would start with Germany. With every wurst under the sun, I think of it as the home of sausage. Next? Well, maybe Poland. Kielbasa. Next? I don’t know. Maybe England with the Bangers and Mash? All the way down on the list, France. What I didn’t know was France is the home of the Andouille sausage. Known so much for its use in Creole cuisine, it was born in France and brought over to New Orleans centuries ago. A simple recipe where every flavor builds on every other one. Onions are cooking and the sausage is standing by. That sauce gets so thick and adds so much texture to the dish. 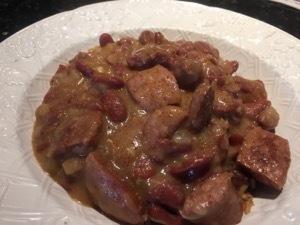 A great dish that just begs to be served over some Cajun rice. 1. In a large saucepan, heat oil over medium. 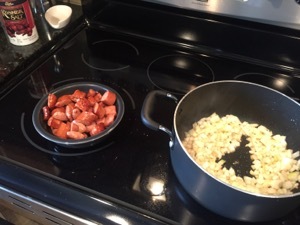 Add andouille; cook until fat is released and sausage is slightly golden in spots, 10 to 12 minutes. Using a slotted spoon, transfer to a plate. Add onion and garlic to pan; cook until softened, 3 to 5 minutes. 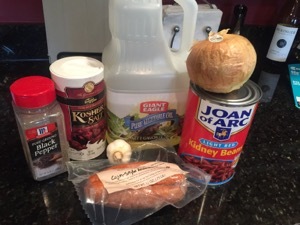 Add beans and 4 1/2 cups water; bring to a boil. 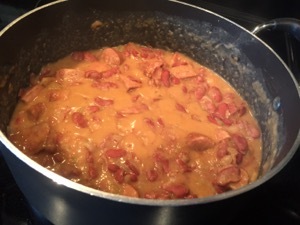 Reduce to a simmer, partially cover, and cook until beans are tender, 1 to 1 1/2 hours, adding more water if necessary. 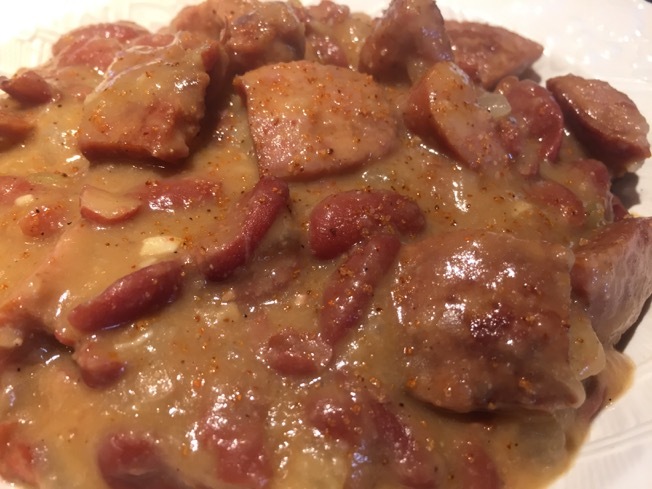 Stir in andouille and heat through; season with salt and pepper.